Good news! 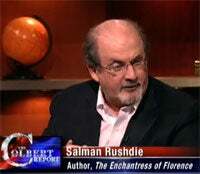 The Satanic Verses author Salman Rushdie believes that video games can change the world. It's always nice to see such positivity! Clearly Rushdie is an open minded man of the arts. While pitching his new book The Enchantress of Florence on a recent episode of The Colbert Report, host Stephen Colbert asked about a "wind of change" coming to the world of Islam. Rushdie, who had a fatwa issued against him by the kind of people who issue those sorts of things, sounded upbeat. Sort of. RUSHDIE: I think the only good sign is that a lot of the younger generation in Muslim countries really wants that change. So maybe they will bring it. COLBERT: What can we do to help? Can we send them video games? RUSHDIE: I think video games, YouTube, you know, these are the things that will change the world. Because when people see what garbage everybody else is consuming, they want it too. Woah! What the hell, Salman? Don't make me start filing fatwa papers against you!